JavaFX 8: Introduction by Example shows you how to use your existing Java skills to create graphically exciting client applications with the JavaFX 8 platform. The book is a new and much improved edition of JavaFX 2.0: Introduction by Example, taking you through a series of engaging, fun-to-work examples that bring you up to speed on the major facets of the platform. It will help you to create applications that look good, are fun to use, and that take advantage of the medium to present data of all types in ways that engage the user and lead to increased productivity. 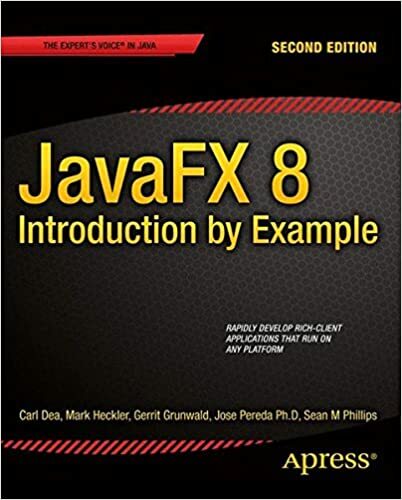 Entirely example-based, JavaFX 8: Introduction by Example begins with the fundamentals of installing the software and creating a simple interface. From there, you'll move in progressive steps through the process of developing applications using JavaFX’s standard drawing primitives. You'll then explore images, animations, media, and web. This new edition incorporates the changes resulting from the switch to Java 8 SDK. It covers advanced topics such as custom controls, JavaFX 3D, gesture devices, and embedded systems. Best of all, the book is full of working code that you can adapt and extend to all your future projects.